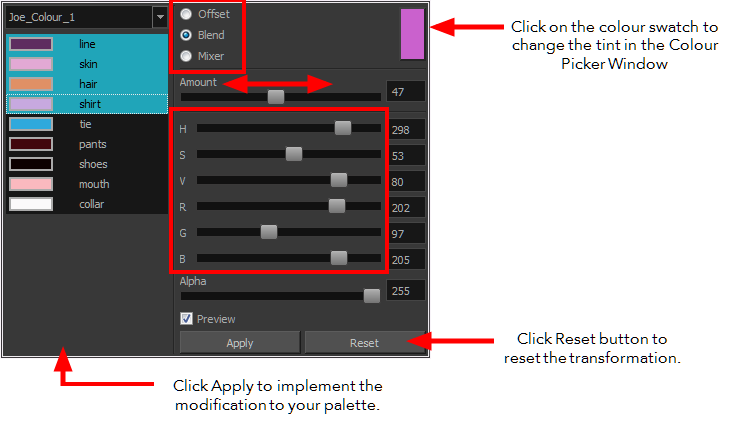 If you want to modify a series of colours to blend a tint in them or offset their RGBA values, you can use the Tint panel. This panel is quite useful when creating palette styles such as night and day styles. 1. In the Colour view, select the palette that contains the colours you want to offset or blend. ‣ From the Colour View menu, select Palettes > Tint Panel. ‣ Right-click and select Tint Panel. 3. 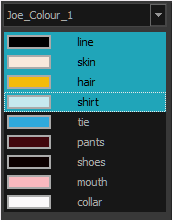 Select one or more colours to modify in the colour list. To select all the colours, press Ctrl + A (Windows/Linux) or ⌘ + A (Mac OS X). 5. Select the Offset, Blend, or Mix option. Offsets the selected colours by the adjustments made using the HSB and RGB sliders. Use the Amount slider to adjust the degree of offset. Use the Alpha slider to adjust the opacity of the selected colour. Blends the selected colours with the colour swatch in the top-right corner. Use the Amount slider to adjust the degree of blend. A blend of 100% turns the selected colours into the same colour as the swatch. Adjusting the HSB and RGB sliders affect the swatch colour, which in turn affects the selected colours on the left. Use the Alpha slider to adjust the opacity of the swatch. Select a Base and Tint colour to form a third colour swatch. Use the slider just beneath to mix the Base and Tint colours by different amounts. This will affect the mixed swatch whether it is selected or not. 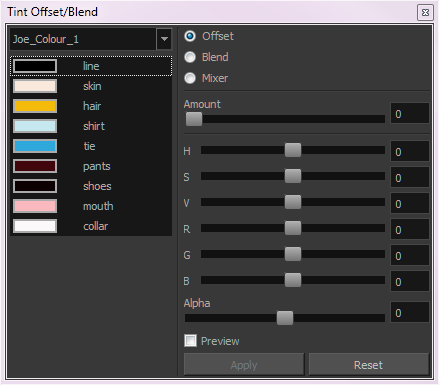 Select either the Tint or Base swatch and use the HSB and RGB sliders to adjust its colour. This will affect the mixed swatch colour, which in turn affects the selected colours on the left.